Buddha are a set of about 10 pictures done by an anonymous Indian artist in the late 60’s. Kitsch, garishly colored and sentimental, these pictures show the Buddha, whether as a young prince or an old man, as an ageless, androgynous milk sop. Despite this, I love these pictures, there is something homely and folksy about them. The recent Telugu film Gauthama Buddha by Allain Sridhar tries and succeeds in showing him in exactly the same way. 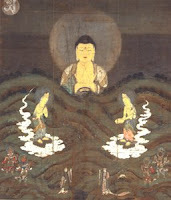 When is someone going to portray the Buddha as he actually might have been? Tomorrow I’m going to have a look at how people have imagined God to be. the anonymous indian left his signature: "padmekar"
and he happened to paint other pictures of hindu deities. and gad! how i look at the indian movie about the buddha with great embarrassment! can't they find a slimmer actor? lol or maybe they had chinese buddha images in mind.